I would consider myself a Firefly fan. I use the word shiny far too often, am hoping to someday have my very own Jayne hat, and am guilty of worshipping at the altar of Captain Tightpants. Yes, definitely a fan. So, I can say without hesitation that Firefly: A Celebration needs to be on your shelf if you, too, are a Browncoat. Firefly: A Celebration is a 544-page faux-leather bound compilation of the three companion books previously released by Titan. Even if you already have those books, you are going to want this one just for the beauty of having it all in one wonderfully thick volume. It truly is something you’ll proudly put on display. This book includes all the show’s scripts, lots of behind-the-scenes photos and plenty of interviews with the cast and crew. There is even a bit of extra fiction from the show’s writers. Yeah, if you’re a Browncoat you’re already counting your coins and it will be worth every cent. Even if you have the original three companion volumes, there are some extras here that make this even more attractive. It includes a beautifully colored prop replica of a banknote and nine frameable photos of the castmembers all tucked into a little pocket in the back of the book. It’s hard to believe that it’s been ten years since Firefly aired and was so abruptly cancelled, breaking the hearts of sci-fi fans everywhere. 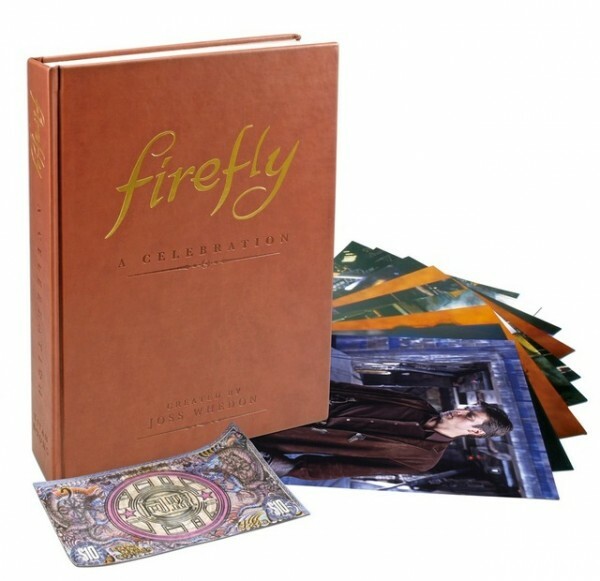 Firefly: A Celebration ($49.95) is the perfect way to remember and celebrate the shiniest show in the ‘verse.